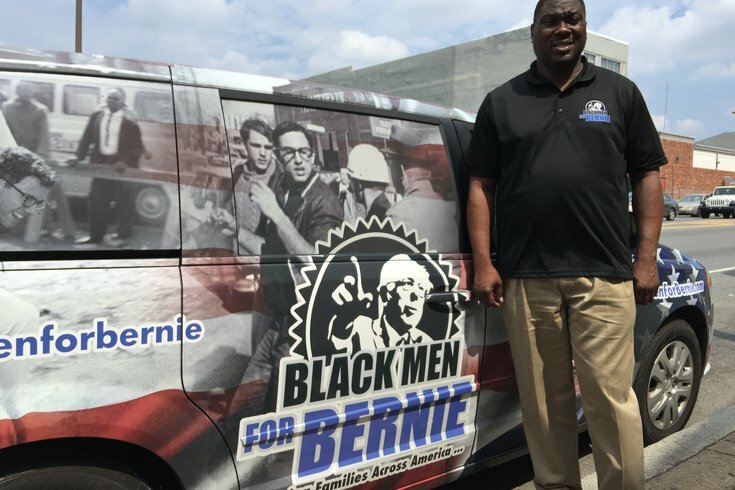 Black Men For Bernie founder Bruce Carter stands outside Barbers on Broad before announcing the launch of the group's 'Get N The Game' initiative on Friday, June 24, 2016. 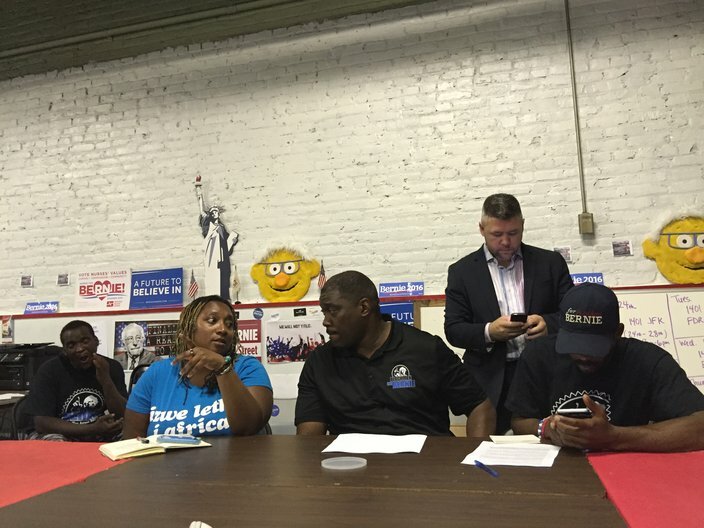 Tucked away in a back room of a barbershop near Broad Street and Parrish Avenue, Black Men for Bernie Sanders founder Bruce Carter led a discussion Friday morning breaking down Democratic National Convention protest plans and long-term goals for what he deemed an ever-growing movement. Joining him at a table were Gary Frazier – an activist from Camden, New Jersey, leading the group’s local efforts – and, among others, Erica Mines, the Philadelphia Coalition for REAL Justice activist who made headlines protesting at a Bill Clinton campaign appearance in April. At an event billed as the “Get N The Game” initiative’s launch, Carter also read an open letter he’d written to Sanders, who declared that he would vote "yes" for primary foe Hillary Clinton in the general election. While Mines wasn’t on board with that particular message, the mission is uniting groups of common interests in advance of next month’s convention. Over the next several months, members of Carter’s group plan to visit 200 cities, where they’ll partner with local barbershops to connect with black men between the ages of 17 and 27 “to address how they can be part of the solutions to the social ills plaguing our communities." Registration and involvement will be their focus of that mission, while the DNC-timed focus will be drawing attention to the challenges facing families in Philadelphia’s poorer neighborhoods with the “hope that something positive will happen when millions of people are watching Philly,” Carter said. In addition to a march planned from Washington, D.C., there will be similar marches through Philadelphia, voter-registration drives (with a goal of 20 million new registries) and events featuring discussions of economic development, inequality and human rights issues. Erica Mines, Bruce Carter and Gary Frazier sit inside a North Philadelphia barbershop to announce their plans for protesting the DNC and beyond. Carter said he will also lead a “deregistration effort” should Clinton get the nomination as expected. They also have two “bucket lists” of people they support and others that they’d like to see voted out of office on both the local and national levels. Mines took a harsher edge against ills in “the birthplace of the so-called democracy we live under,” seeking people to align themselves against the struggles facing the black and brown communities. She chided Mayor Jim Kenney for not doing away with police stop-and-frisk practices and decried limitations on protests, increased police presence throughout the city and moving “homeless people out of Center City” as the convention approaches. Frazier said he’s already been in eight states personally. “We’re not going to lay down for the Democratic Party. Bernie can do what he wants to do, but he doesn’t control the masses of people. Real change has to come,” he said. “I’m not afraid of Donald Trump,” he said. “I’ve had white men as president that really didn’t care about different people. That doesn’t scare me. I’ve lived that life. People who’ve been poor, they’re not afraid of that, either. The only people who are afraid are the people that will be comfortable. As for logistics, Friday’s launch represents the start of an effort where supporters will visit some 200 cities across the country before Election Day. PhillyVoice will keep you apprised of the group’s local efforts through the DNC and beyond.